Novak Djokovic extended his winning streak against Britain’s Andy Murray to seven matches with victory in a gruelling Miami Open final. 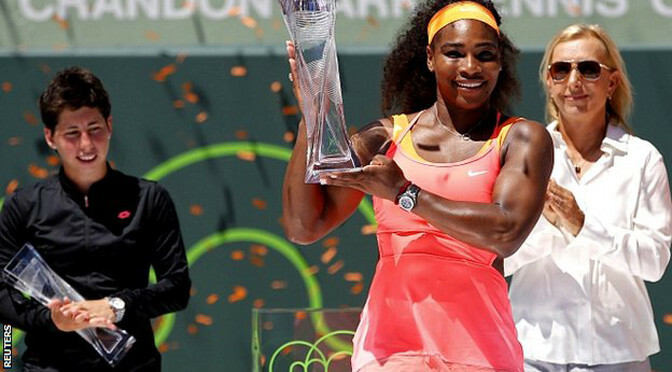 The world number one prevailed 7-6 (7-3) 4-6 6-0 in hot and humid conditions to win his fifth Miami title. Djokovic, 27, takes his record against Murray to 18-8, and the Serb will tie Rafael Nadal’s total of 141 weeks at the top of the rankings on Monday. Murray, who gets married next Saturday, will move up from fourth to third. The Scot, 27, twice led by a break in the first set and looked to have the momentum heading into the decider, but ultimately came up short once again. 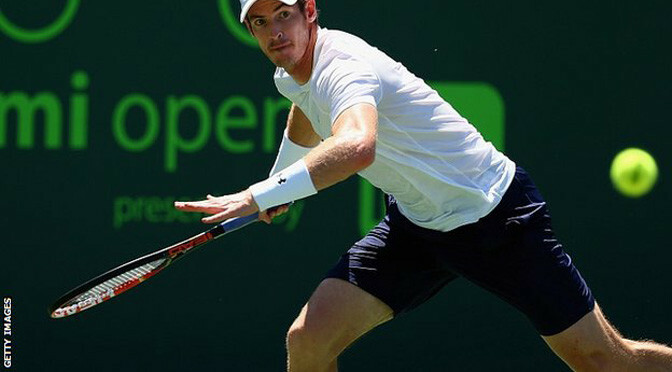 Britain’s Andy Murray reached his fourth Miami Open final with a convincing straight-sets win over Czech eighth seed Tomas Berdych. Third seed Murray won 6-4 6-4 and will play world number one Novak Djokovic or 22nd seed John Isner on Sunday. The Scot, 27, broke Berdych’s serve four times as he took his career record against the Czech to 6-6. Murray, who won the Miami title in 2009 and 2013, is set to return to third in the world rankings next week. Friday’s first semi-final was a repeat of the Australian Open clash in January, which Murray won in four tense sets as he went up against Berdych and former coach Dani Vallverdu. There was another familiar face in the Berdych box in Miami after fitness coach Jez Green recently began working with the Czech, having left Murray’s team along with Vallverdu last November. In contrast to Melbourne, Murray made the sharper start this time around, breaking the Berdych serve either side of dropping his own as he took charge early on. Berdych looked unsettled, complaining about the balls at one stage and then a line call as Murray saw out the set by making an impressive 77% of first serves. Things got worse for the Czech at the start of the second as a confident Murray broke to love, but the Briton handed him a lifeline as two double faults gave the advantage straight back. Both men were stepping in and attacking returns at every opportunity, and Murray’s strength in that area proved the difference when he broke the Czech for a fourth time as the pattern of the first set was repeated. Murray almost clinched victory with a fifth break and had to recover from 0-30 when trying to serve it out, but a rasping forehand sealed victory and he let out a scream of delight. 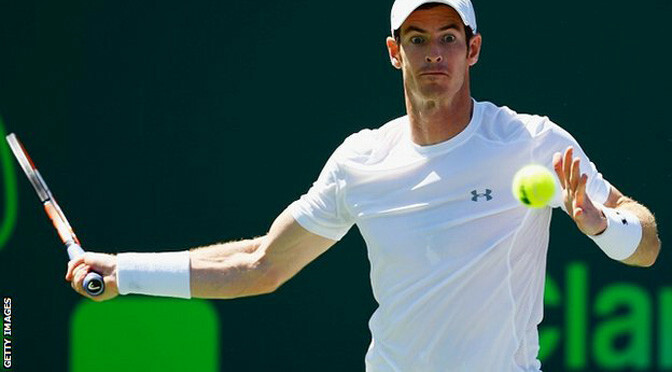 Andy Murray dismantled Colombian Santiago Giraldo’s hard-hitting game to claim his 499th career win and reach round four at the Miami Open. The Briton, seeded third, won 6-3 6-4 and will play South Africa’s 15th seed Kevin Anderson in the last 16. Another victory would make Murray the 46th man in the open era to reach 500 match wins. Rafael Nadal is in action later on Sunday, while women’s top seedSerena Williams beat Cici Bellis 6-1 6-1. Murray, 27, lost heavily to Giraldo in Madrid last year but made amends in Miami, where he lives and trains for much of the year. Heather Watson claimed the biggest win of her career as she beat Agnieszka Radwanska 6-4 6-4 to move into the fourth round of the BNP Paribas Open. Watson had never beaten a top-10 player before and had lost to Radwanska at Indian Wells last year but broke the seventh seed five times on her way to victory in an hour and 33 minutes. Victory in Hobart in January had given Watson the second title of her career and the world No.43 will now take on either Carla Suarez Navarro or Anastasia Pavlyuchenkova in the last-16 in California. The 22-year-old had not won a set against Radwanska in three previous WTA meetings but broke in the first game on her second break point and then held her save to take a 2-0 lead. Radwanska held and then broke back but Watson was giving her opponent some serious trouble and once again claimed the advantage on a fourth break point. The rest of the set went with serve but it was Radwanska who was being made to work the harder and Watson closed out with an ace. Watson needed just one break point to again take the early advantage in the second set and she then held her serve again although Radwanska won the third game to love. The Pole seemed to have found some rhythm and just as in the first set broke back for 2-2, although she required three break points to do so. Radwanska was beginning to build up a head of steam now and eased through her next service game before breaking Watson to make it four games in a row. The match looked to be swinging Radwanska’s way but Watson halted her momentum by getting back on serve and seeing off two break points for an impressive hold to make it 4-4. The momentum was now back with Watson and she won the next on a second break point before serving out to love to take the match. “Aga is a fantastic player,” Watson told BT Sport 2. “I’ve played her quite a few times and she’s beaten me pretty comfortably every single time so I knew I was going to have to bring my A-game and play my very best and that’s what I did. Elsewhere, tenth seed Lucie Safarova was beaten 7-6(5) 7-5 by Elina Svitolina in little under two hours on court. 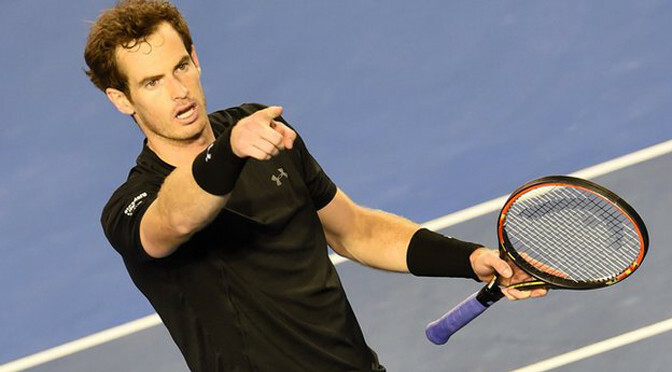 Andy Murray has swapped places with Rafael Nadal to move to third in the ATP world rankings. The Scot, 27, climbed to his highest ranking since occupying second place after beating Serbia’s Novak Djokovic in the 2013 Wimbledon final. He had dropped to 12th in September 2014 after missing three months following back surgery on a long-standing disc injury the previous year. Murray plays in Dubai this week along with Novak Djokovic and Roger Federer. Second seed Federer opened with a 6-3 6-1 win over Mikhail Youzhny on Monday, with top seed Djokovic facing Vasek Pospisil and Murray taking on Luxembourg’s Gilles Muller at 12:00 GMT on Tuesday. British number two James Ward will plays Spaniard Feliciano Lopez after coming through qualifying to reach the main draw. Murray’s last outing was a quarter-final defeat to Frenchman Gilles Simon in the Rotterdam quarter-finals last week, but his form over the past few months has been impressive. The Scot won back-to-back ATP tour events in Shenzhen, Vienna and Valencia towards the end of last season, and started 2015 by reaching the final of the Australian Open, where he lost in four sets to Djokovic. In all, five of the top eight seeded players failed to reach Thursday’s quarter-finals: Kvitova, Ivanovic, No.5 Agnieszka Radwanska, No.7 Angelique Kerber and No.8 Williams. Halep ousted Tsvetana Pironkova 6-4 6-3, while Wozniacki beat 15th-seed Alize Cornet, last year’s finalist, 6-4 6-0. Halep, who lost her serve on double-faults in the first game of both sets, said she was unaware of all the seeded players that lost ahead of her on Wednesday. Wozniacki knew of the upsets. Nevertheless, she wasn’t concerned she might suffer the same fate.